SORO NC has a staggered election system, so roughly half the seats are open every two years. In this election, the NC has five residential district seats, three at-large seats, two business seats, two organization seats (one with a partial term), and one school seat open. You can see the SORO NC zones on our Mapping SORO page. For the organization seats, the highest vote-getter will have a four year term, and the second-highest will have a two year term. The final voting results are listed below. Elected candidates are designated with a green checkmark. You can view the final canvass of votes, including vote totals. Our thanks to all the candidates, the many local volunteers who helped organize the election, our partners at EmpowerLA, and Shenandoah Elementary for hosting the polling. Most importantly, thanks to the 517 voters who helped choose a strong and active Board. All candidates were given the option to complete a questionnaire for May 19th's Meet the Candidates event. You can download individual answers below, or all returned questionnaires in a single PDF. I have been a resident of the South Robertson Neighborhood since 2004. My family also resides in this neighborhood. I love that this neighborhood is open and welcoming to citizens from all walks of life. I'd like to see the trend of new businesses, including exciting restaurants, continue. I am an L.A. native and have lived in SORO for the last 8 years. My wife and I are truly blessed to raise our two kids in this community, but there is so much more that our community can do. The Neighborhood Council was started to take an active step in making this city the best it can be, and although it has taken admirable steps in this pursuit, it needs leaders that can truly influence the diverse community that the neighborhood encompasses. It would be an honor and a privilege to represent each and every one of you in helping our community reach its true potential. I've been a resident of Reynier Village since 2011. I've enjoyed getting to know the wonderful residents and businesses of the area and want to do all I can to serve the community and address current issues and quality of life issues which frequently come up recently. As a father of young children, these issues have pressed me to want to do more and join the SORO NC. I look forward to meeting those of you whom I have not yet met. 1. As a resident of Soro for over 50 years I know the diverse components of the community and work well with all of them. 2. I serve as a member of the Land Use, Transportation, Outreach, Bylaw, Quality of Life, Parks & Recreation, Finance and Robertson Revitalization Committees. 3. I am the Chair of the Transportation Committee. I have held this office for the past 3 years. In prior terms I was Chair of the Public Safety Committee and the Bylaws Committee. 4. I represent the Neighborhood Council on the City's LADWP Oversight Committee. 5. I am one of two Soro NC Board Members elected as a Budget Representative to LA Budget Advocates. I have held this position for more than 4 years. During the last 2 years I have also served as a Budget Advocate. I am passionate about improving the quality of life for all stakeholders. Personal Statement – With my experience in business and my time spent as a resident in Zone 9 of the South Robertson Neighborhood I believe I can be an effective representative for my fellow residents in dealing with the many issues that impact the general well-being of the neighborhood and its residents. I am especially concerned, not only about the increase in traffic, but also about the recklessness of that traffic. I see cars not stopping at stop signs, stop lights and for pedestrians. Paula Waxman: Professional Experience: VP, Prints & Drawings, Sotheby Auction House; Curator, Norton Simon Museum; Director, Cramer Foundation; Teacher, LAUSD. Resided in Beverlywood since 1981; SORO Board member since 2009. Chair, Green Team Committee. During my board tenure, I established and manage a community garden at Hamilton High School. For Beverlywood, I organized a Town Hall on water conservation with experts on drought tolerant gardens, grey water and rain capture systems, and DWP plans and rebates. The Green Team conducts yearly urban fruit picks and e-waste drives; coordinated two Robertson/Pico tree plantings; distributed compost bin and rain barrels. We are researching state cap and trade, and city funds to alleviate traffic through Beverlywood via creating bike paths, connectivity from Expo stops to Century City and B.H. and improving walking streets. I helped launch the citywide NC Sustainability Alliance, which joins all city green committees. I was born in SORO, my parents live here, and my grandparents lived here. I am proud to be living and raising a daughter here while working as a software engineer. I love LA and this part of it most of all. It is a great place to live, to work, and to play. This neighborhood is safe and beautiful, but it takes work to keep it that way. I'd like to join the neighborhood council so that I may help do that important work. I am currently a board member and as Education Committee Chair, I created and run a tutoring program at Shenandoah Street Elementary School. I also created a Town Hall forum for the candidates for LAUSD School Board district #1 in the last election cycle so the neighborhood could assess the many candidates running for the office. I brought a Fresh Fruit on Friday program to Shenandoah Street Elementary School as well. I have been active in our community and look forward to continuing my service. Re-Elect Terrence Gomes! Making SORO Better Together! Terrence has been a part of the Board for eleven years and has been there for the Community. Communicating with the City Departments to bring services to the Community. Listening to the Community, when others will not. Terrence is a problem solver that can get the job down. Re-Elect Terrence Gomes for Business Representative at the SoRoFest 2016 on June 5, 2016! I’m the Deputy Director of The Relational Center, a 501c3 nonprofit organization that moved into SoRo in November of 2014. After years of working with technology during the 90’s dot com movement I went back to school to move into a career focused on advocating for marginalized issues, fostering collaboration, and encouraging social justice in teams, organizations, and communities. I have been on the SoRo Neighborhoods Council as an organization representative since fall of 2015 and have been an active board member serving as Vice Chair of the Quality of Life committee. I am currently working on a couple great SoRo projects: a community mural on Robertson Blvd. and an open house promotional event for local businesses. My priorities as a board member fall into two general categories: (1) Improving civic engagement amongst SoRo residents to tackle community issues and (2) Supporting local businesses and trying to bring new businesses into the currently empty storefronts on Robertson. In 2003 I chose to plant roots in SORO and in 2004 was able to buy a home in Reynier Village. It is my intention to serve on the SORONC representing RVNA of which I've been a member since it's inception. I’d like to ask for your vote. This neighbourhood has been home to my little girl since 2009. I adore my neighbourhood and have some truly wonderful neighbours that have become close friends (and some that have become family)…but there are opportunities to improve that must be considered...many of these have been allowed to develop unchecked for so long that they now appear unmanageable. But, they are not and only require good people to do hard work. I would like to be part of that hard work. Vocationally, I've been a dishwasher, labourer, cabinet maker, truck driver, and Manager for decades in a Fortune 50 Corp. where my Ops were 200+ employees and ~$70M/yr. Having been born and raised in Los Angeles, I care deeply about issues that affect its residents. As home owner and longtime Soro resident and Soro business owner, I am keenly aware of the issues affecting my neighborhood and would like to contribute to the effort effecting meaningful change. Having been a entrepreneur in the technology space for a decade, I am accustomed to thinking outside the box when it comes to innovative and cost effective solutions to solve complex problems. I have a diverse skill set, ranging from public speaking, to developing software and infrastructure. I also happen to speak Spanish fluently. I'm a father of two small kids, husband to a physician at Cedars-Sinai, and a grad student at UCLA. My family and I are always out and about in the neighborhood: whether playing at Robertson Park, taking swim lessons at the Beverlywood Swim School, checking-out books at the Robertson Branch Library, or merely walking around the neighborhood. I take pride in our neighborhood and would like to give back by participating on the SORONC. I enjoy talking to neighbors so I look forward to getting to know you and working to ensure your voice is heard at City Hall. Thank you for your vote! My name is Gary Kasbarian and I am the Managing Partner of CaroTech Automotive in the South Robertson Neighborhood (SORO.) I am in the Zone 10 District. I am interested in candidacy for At-Large Representative for our local community. I believe the most effective way to see change in our local community is to partake in the local government. I am an active volunteer in civic organizations. I believe my enthusiasm, professional experience, policy and planning background will be a great asset to our neighborhood. I am a strong advocate in promoting the small businesses in our community. I am here to make a change to promote safety and growth in our neighborhood. Since relocating to Los Angeles five years ago, I’ve moved to several communities within the city looking for a place that felt right. A place that’s diverse, walk-able, community-focused and centrally located. It was not until I purchased my (first!) house in Crestview last year that I finally found a community that I am proud to call home and plant my roots in. I am excited to bring my experience as a field organizer in Oakland, CA to our local community. I realize that this community is undergoing many changes with an influx of new residents, growing businesses and a complex relationship with our greater Los Angeles neighbors. I look forward to being a voice for our community as we continue to pay homage to the SORO community’s past and evolve with the changes around us. As a native Angeleno, I've seen this city transform throughout the years. I'm excited to see what L.A. has in store for those who live and work here. As a homeowner, I am particularly interested in the city's investments in infrastructure to support more pedestrian-friendly strategies and L.A.'s pivot away from the car in anticipation of what will be a bigger population in the future. In my position as an At-Large Representative, I will employ sound logic and rationale in every decision I make on behalf of the South Robertson community. I will conduct focused research and analysis about issues being discussed before arriving at a conclusion. I will consider all sides of an argument when making decisions that affect our neighborhood—everyone from the homeowner to the business owner. Additionally, I want to work with the Business Representatives and others in the community to bring more active storefronts to South Robertson to ameliorate what are currently underused spaces. I am a current graduate student at UCLA's Master of Urban and Regional Planning program, and I want to become more involved in the welfare and common interests of my neighborhood. I am particularly interested in reforming parking policies in the neighborhood to increase parking availability and prevent illegal parking practices. I have been a resident of Zone 6 in SORO for the past 9 years. I am a Senior Architecture Manager at Modative, a design-build firm, also located in Zone 6. We moved here as a 3-person firm; we have grown to 19 employees and design and build residential projects throughout LA. As a designer, I have collaborated with many neighborhood councils, land use committees, and neighborhood groups across LA. I am well-versed in zoning and municipal codes, land use and planning regulations, entitlements, and conditional use permits. I bring with me many skills I have honed in my professional career as a designer, project manager, and as a mother of a 4-year-old daughter. I am an excellent communicator, both verbal and graphic. I am an astute listener, a critical thinker, and a problem-solver. I am also unceasingly optimistic. I believe that, with my skills and my experience, I will be an asset to this Council and our neighborhood. I look forward to the opportunity to build a stronger community. Hello, my name is Gloria Joseph Dioum. It has been two years since we moved into this beautiful neighborhood we all call home. Since then, I have experienced and observed so many great features that this unique community has to offer. As a newer member of this community, I believe I can bring fresh lens that enable me to imagine the future all while respecting what has made this such a desirable and wonderful community. For example, there are opportunities to reduce traffic congestion, to increase beautification, to improve walkability and to foster small business development along Robertson. I feel that my 20 years of organizational leadership experience will add strength, purpose and wise decision making to our team. I approach all tasks at hand with energy and a style that strives for quality outcomes. In closing, a vote for Gloria Dioum is a vote for someone who will (at all times!) think of what benefits our community long-term. Vote for me today! I am a current At-Large Representative on the SORO Board, and running for the same seat. I attend meetings reliably and actively, and participate in research & debate - from parks to parking, cell towers to zoning, education to safety, greenery to good government. A few of you already know that I am accessible and glad to act to support good causes with action. Vote for me and so that I can continue serving the community. SORO is my home. I met my wife here, and we now have 2 children who attend school here. My wife and I work here. My family attends synagogue here, socializes here and shops here. We can be seen on the streets and in the parks, in the art galleries and the bookstores, in the banks and the grocery stores. I am part of the diversity as well as the unity of the SORO community. I am also great listener and want to hear your concerns for our community. Write to me at kenblaker@soronc.org. Vote for me. Put me to work as your representative. I have lived and enjoyed our unique neighborhood most of my adult life. I've raised my 2 lovely daughters here because I value this community. Together we appreciate our neighbors & friends: unique local establishments; great public schools, library and parks; proximity to the hub of LA cultural life and the diversity of influences creating our own 'spirit of place' within the sea of anonymous areas of Los Angeles. My expertise as an Architect & Urban Designer and passion for communities with a supportive 'Quality of Life' have given me the ability to hone my skills to understand the civic and development process to create well balanced neighborhoods supportive of the community. I have been a long standing member of SORO's Land Use and Transportation Committees and plan to continue these efforts. I also want all community members to feel they have leaders who want to hear their community needs and dreams to together make them reality. We have been residents in the neighborhood for three years at this point and have been excited about the growth and change that we have seen happen for the better in our area. It would be an honor to be part of the team with oversight into issues impacting the community in order to impact lasting change where it is desired and to help maintain the best aspects of the neighborhood that the community has enjoyed for many years. Fellow Angelenos, My name is Megan Abboud and I am ready to be your Representative At-Large on the Southern Robertson Neighborhood Council. Having lived in SORO for 22 years I have developed a strong understanding of our community and opportunities for improvement. I will use my passion and dedication to tangible change to effectively represent our community. A few years ago my wife and I moved to SORO and last year we welcomed our daughter to our family. Over the years we have come to love and appreciate our neighborhood – we are continually amazed by the diversity and warmth of its residents – and we look forward to raising our daughter in this community. We are even more excited about the possibilities of South Robertson becoming a more vibrant community and I’d like to be part of that effort. The uniqueness of and the opportunities to grow SORO has inspired me to run for the neighborhood council. I bring strong analytical and communication skills from my electrical engineering, business and financial services background. I combine my abilities as a problem solver and organizer with my interpersonal skills and believe that consensus building is a way towards achieving greater outcomes. I hope to work with each one of you to accomplish more as a community. Thank you for your vote! I chose the Beverly Wood area to open my business to bring the diversity of the Arts and Business networking in 2014. I am very passionate and hands on to bringing these ethics to this community on a regular basis. I have served as an Economics Commissioner and a Chamber member in the city of Duarte for 2 years (2009- 2011-2012) and was very present in every needed or necessary arena to assist in the growth of the community, which is my intention in the SORO community. My strength is marketing, special events, promoting the arts, education and business networking. I moved to LA 4 years ago. Prior to that, I was a community activist and two-term local Mayor in a New York suburb called Roslyn Harbor for 8 years. As a local Mayor, I reduced taxes over my tenure while simultaneously building a playground, renovating public facilities and infrastructure, introducing a private security patrol to reduce crime, and adding municipal garbage and recycling service. I also chose NOT to pay myself a salary. I made my community a better, safer and friendlier place to live. It wasn’t easy. It took a team of dedicated community volunteers. But we did it. Please support my candidacy for SORO NC so that I can bring my proven expertise to SORO to make my new LA community- OUR COMMUNITY- a better, safer and friendlier place to live. I am now proud to work with local schools through the Junior Civic Engagement Program that I started to teach young people to be active citizens in our democracy. The NC represents and advocates for our community’s wants and/or needs to local government officials and entities; builds partnerships with government so that government is more responsive to local needs; fosters a sense of community; and decides how to spend the City’s annual financial allocation ($42,000 this year) for priority community activities and projects. You don't have to registered in a city, state or federal election to participate; any SORO stakeholder aged 15 and above can vote. The City defines a stakeholder as "those who live, work or own real property in the neighborhood." But that's not all. The definition was recently amended to include "those who declare a stake in the neighborhood as a community interest stakeholder, defined as a person who affirms a substantial and ongoing participation within the Neighborhood Council’s boundaries and who may be in a community organization such as, but not limited to, educational, non-profit and/or religious organizations." If you choose to vote in person, you just need to show an ID and verify your stakeholder status through simple written self-affirmation on election day when you arrive at the polling tent at the SoRo Festival between 11:30am and 3pm on June 5. There's no need to preregister. If you do choose to vote online, you must register first by May 31 (see the yellow box at the top of the page). Actual voting will be open online between May 15 and close of polls at 3pm June 5. 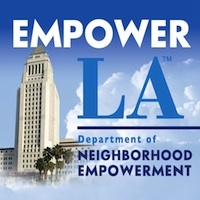 Our thanks for the enormous effort and support given by Jeffrey and the EmpowerLA team.